classic runabout with open bow holds 9, lots of room to stretch out. 28 hrs and never left in the water. warehoused when not in use. 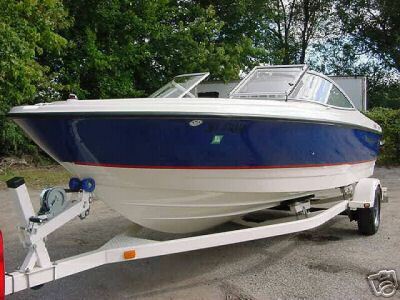 absolutely like new !22 ft is ideal for keeping a smooth ride and the open bow allows you to carry the whole group. 5 litre merccruiser offers plenty of power for play, sking, tubing, wakeboarding. easy on fuel so you can run all day. this boat is truly excellent, came right here from mo lake.want to save thousands yet have the look and dependability of new. here's your boat. pulls easy with even small pickup or suv. will include 4 bumpers, oar, anchor, life vests, ropes. everything so you can go straight to the lake.